According to the Americans with Disabilities Act (ADA), a service animal is an animal trained to do specific tasks for an individual related to the person's disability. The ADA has a broad scope, and several types of assistance dogs fall under its purview. A guide dog is an assistance dog for the blind or visually impaired. The Seeing Eye was the first organization in the United States to raise and train guide dogs. A guide dog will prevent its handler from walking into dangerous streets or obstacles and can help locate items. The Seeing Eye uses German Shepherds, Labrador retrievers, golden retrievers, and mixed breeds in their program. Guide Dogs for the Blind notes that dogs of this size are best suited to the tasks they must perform. A guide dog must be large enough to help its handler navigate obstacles. Additionally, these breeds don't need special grooming, and they are well-adapted to most climates. Guide dogs are typically raised in foster homes once they have been weaned from their mothers. When they are between one and two years of age, they return to the training facility. Guide Dogs of America train their dogs using positive reinforcement techniques. The dogs learn necessary skills over a two to six month period. Once a guide dog is trained, it must be paired up with a handler. Most guide dog training organizations require that the potential handler complete a supervised training course with their dog. This can last two to four weeks, depending on the organization. A hearing assistance dog helps people who are deaf by alerting its handler to noises such as an alarm clock, doorbell, telephone, fire alarm, or crying baby. The dog will make physical contact with the hearing-impaired person and will bring him to the source of the sound. Many organizations provide hearing dogs for the disabled. Most hearing dogs are small to medium sized dogs. They are not required to pull or carry objects. Hearing dogs must have a high energy level and be ready to work at a moment's notice. Assistance Dogs International says that popular breeds include terrier mixes, poodles, cocker spaniels, Lhasa apsos, Shih Tzus, and Chihuahuas. Dogs for the Deaf teaches their hearing dogs to recognize a specific set of sounds over a four to six month training period. Obedience training, temperament evaluation, and socialization skills are also part of this training. Once paired with a handler, three to five days are spent in team training. It is unclear how some dogs can detect an oncoming seizure, but anecdotal reports of this phenomenon have led to the training of this branch of assistance dogs. A study in the journal Seizure, showed that a set of dogs trained for the purpose were able to reliably alert their handlers 15 to 45 minutes prior to a seizure. The Epilepsy Foundation notes that seizure alert dogs may respond in a variety of ways when their handler has a seizure. Some dogs will alert a parent if a child is experiencing a seizure, while others will alert the epileptic individual so that he can take precautions to prevent injury or a seizure in public. They may also stay near an epileptic who is having a seizure to help prevent further injury. There are no specific breeds preferred as seizure alert dogs. According to Liz Rudy, DVM, in a newsletter for the National Service Dog Center, a dog's personality and temperament are the most important factors in becoming a seizure alert dog. 4 Paws for Ability points out that you cannot train a seizure dog to predict an oncoming seizure. Rather, certain dogs already have the skill and the training reinforces the inherent behavior. Dogs are trained using positive reinforcement. Mobility assistance dogs help the disabled by performing carrying and other physical functions when their handler cannot. Canine Companions for Independence notes that people with multiple sclerosis, muscular dystrophy, cerebral palsy, severe arthritis, or a spinal cord injury can all benefit from a mobility assistance dog. A mobility assistance dog may perform tasks such as turning a light switch on or off, picking up items and bringing them to the handler, pulling a wheelchair, or opening or closing doors. The best breed for a mobility assistance dog will depend on the exact nature of the tasks that need to be performed. Committed Canine notes that many large breeds that weigh less than 100 pounds are commonly used, including Labrador retrievers, golden retrievers, German shepherds, Doberman pinschers, or standard poodles. Mobility assistance dogs may be required to perform a greater variety of skills than other types of assistance dogs. Additionally, the pulling and carrying functions cannot be taught safely until the dog's growth plates have closed. The Delta Society has outlined a comprehensive manual of the minimum standards for service dogs which contains many of the skills that mobility dogs learn. Allergen detection dogs help their owners by recognizing the scent of a dangerous allergen at an extremely low level and alert their handler so that he can avoid inadvertent exposure to the trigger allergen. Popular choices for allergen alert dogs include Labrador retrievers, golden retrievers, and Portuguese water dogs. Angel Service Dogs tries to match a breed to a handler based on individual needs. Those breeds with lower shedding tendencies and less dander may also have some advantages over others breeds. Positive reinforcement and reward-based training systems are used to train allergen alert dogs. According to Peanut Detector Dogs, temperament and socialization skills are also emphasized. A canine companion can assist a person with a psychiatric disorder in several ways. However, the ADA does not include all dogs used for therapy or emotional support under its definition of a service dog. To fall under the accessibility laws of the ADA, a service dog must be trained to perform specific tasks that the disabled individual cannot do. The International Association of Assistance Dog Partners (IAADP) outlines a comprehensive list of some of the tasks that a service dog may be able to perform for handlers with psychiatric disorders. These can include bringing the handler medication, dialing 9-1-1 on a special phone, summoning help from another room, or providing mobility assistance. The U.S. Department of Veteran's Affairs is conducting research into how an assistance dog can help soldiers with post-traumatic stress disorder (PTSD). Emotional support dogs do not currently qualify as assistance animals, but they can help the healing process in less concrete ways. 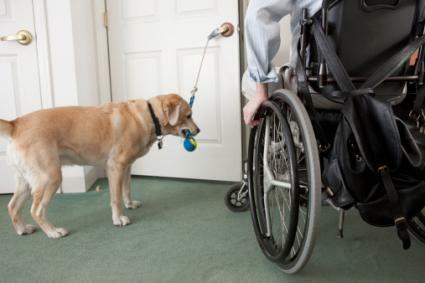 The breeds best suited to assist someone with a psychiatric disorder are similar to those used as mobility assistance dogs, as the required tasks are similar. Little Angels Service Dogs points out that training can take up to two years. However, the final step in which the handler is trained to work with his new dog lasts two weeks. An assistance dog can be a great asset to people with a variety of disabilities. 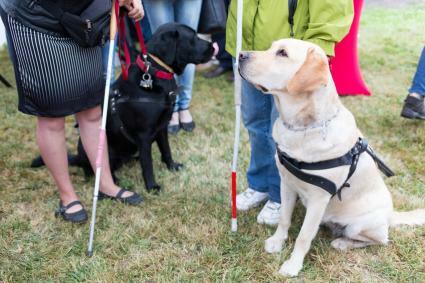 The types of jobs that dogs can perform is continuing to expand, and with further research and training, more people struggling with disabilities will be able to find help through assistance dog organizations.